Green Bay QB Aaron Rodgers admitted his performance in the team’s November 4, 2012, 31-17 win over Arizona “…wasn’t one of my better games.” For the record, Rodgers had four touchdowns for 218 yards on 14-of-30 passing. But Rodgers four touchdowns with less than 15 completions and a passing completion percentage under 50 percent put him in a select group of quarterbacks in NFL history. Let’s start with the four TDs and fewer than 15 completions. Rodgers in that game became the 75th QB since 1966 to have four or more touchdown passes in a game with fewer than 15 completions. The last QB to accomplish this prior to Rodgers was Chicago Bears QB Jay Cutler, who was 14-of-21 with four TDs in a November 28, 2010 win over the Eagles. After Rodgers reached these numbers in that November 4th contest, three more QBs also had four-plus TD passes in a game where they completed less than 15 passes. Robert Griffin III on November 18 had four TD passes on a 14-for-15 passing performance; Colin Kaepernick was 14-for-25 with four TD passes in a December 16 game; and Eli Manning had five TD passes in his final game of the 2012 season by completing 13 passes on 21 attempts. Teams that had a QB reach these numbers have been pretty successful; teams are 75-3 in games when their QB has four-plus TDs and less than 15 completions in a game. The last team to lose a game when their QB passed for those numbers were the Washington Redskins on September 17, 1989, when Mark Rypien had four TDs with 12 completions in a loss to the Eagles. 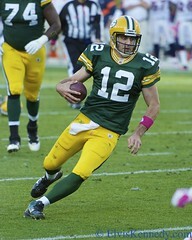 Rodgers was the second Packers QB to accomplish this feat in a game. Think you know the other? Answer at the end of this piece. Doug Flutie holds the NFL mark for fewest completions with four or more TD passes. Flutie threw for four TDs with the New England Patriots in a 1988 win over the Chicago Bears but had only six completions on 18 pass attempts in that game. One more stat on Rodgers’ game November 4: Rodgers became the 31st QB since 1966 to have four TD passes with a completion percentage under 50 percent. Rodgers was 14 of 30, a 46.7 completion percentage. It was the fourth time since 2000 that a QB had four-plus TDs and a completion percentage under 50 percent. The last QB prior to Rodgers to have these numbers was New York Jets QB Mark Sanchez on November 27 of last year. Sanchez was 17 of 35 (48.6 percentage) with four TDs in their 28-24 win over Buffalo. After Rodgers’ game with four TDs and a completion percentage under 50, two more NFL QBs reached that milestone last season. Chad Henne on November 18 had four TD passes in a game where he was 16-for-33 (48.5 percent); rookie Andrew Luck had four TD passes on December 2 on a 24-for-54 performance (44.4 percent). Four quarterbacks have had two games with these numbers: Randall Cunningham, Daryle Lamonica, Dan Marino and Joe Namath. Flutie again holds the NFL mark for worst completion percentage with four-plus TD passes in a game. Flutie had a 33.3 percentage in the game mentioned above. Namath is the only other QB to have a completion percentage under 40 percent with four or more TDs in a game. He was 12 for 31 (38.7 percent) with four TDs in a September 18, 1966 game against Houston. Trivia answer: If you guessed David Whitehurst, you know your Packers. Whitehurst had four TD passes on 10 completions in a September 10, 1978 win over New Orleans.